Foods for lowering bad cholesterol – Cholesterol in the blood could be the origin of many deadly diseases. That’s as much as the bad cholesterol in the body must be removed. Eliminating bad cholesterol can be done easily by consuming foods that are known to reduce cholesterol. There are several types of healthy foods that are good for health, especially in lowering bad cholesterol. The foods not only beneficial for lowering cholesterol but also reduce blood pressure. Food for lowering cholesterol is readily available. So, it’s be an excellent solution for maintaining health, like eliminate bad cholesterol. 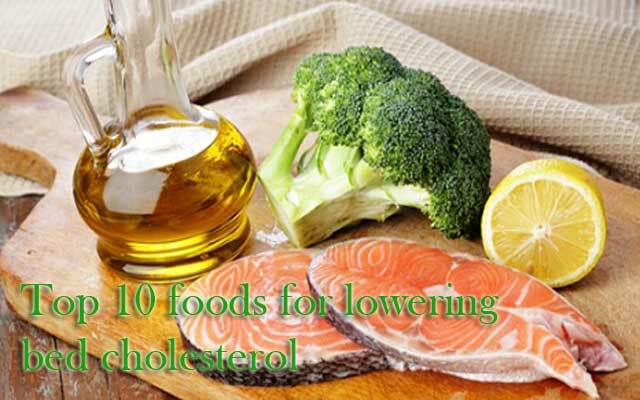 The following are list of foods for lowering bad cholesterol. Oatmeal is food that contains soluble fiber, so it is beneficial to remove cholesterol in the body. Not only in oatmeal, but also soluble fiber present in foods like pears, bananas, red beans. Soluble fibers work reduces the absorption of cholesterol in the blood. It is reduces buildup of cholesterol in blood. Further food for lowering bad cholesterol is red wine. Red wine have a very significant impact on lowering bad cholesterol (LDL). A study conducted in Spanish university said that red wine can reduce bad cholesterol levels 9% -10% if regularly consumed. Omega 3 fatty fish also include foods that are good for lowering bad cholesterol. Among these are salmon, mackerel, sardines. Fish is not only beneficial for lowering bad cholesterol but also beneficial to provide omega 3 intakes to the body. Omega 3 is beneficial for the heart and decrease the risk of blood clots. Soybeans also include in foods for lowering bad cholesterol, as well as a variety of food from soy products such as tofu, tempeh, soy milk. Research says that soy is effective in lowering cholesterol about 5% – 6%. Fruits and vegetables also play role in lowering bad cholesterol in the body. Means are fruits that contains many antioxidants as blueberries, acai berry, blackberries, strawberries, cabbage, mango, broccoli, apricot, pumpkins, peppers, cranberry, pepper, carrots, spinach and more. So, it is important for you to incorporate healthy foods into the menu daily food. Other foods for lowering bad cholesterol is fat-free yogurt. These foods are not only rich in protein but also contains a microorganism. This microorganism is beneficial for lowering high cholesterol. Avocados are also included in the list of foods for lowering bad cholesterol. Avocados contain monounsaturated fatty acids that are useful to raise good cholesterol (HDL) while lowering the bad cholesterol. The content of vegetable oils in the avocado will reduce the amount of cholesterol in diet. However, avocados are high in calories, it is advised not to eat excessively. Olive oil is one of God’s gifts are extraordinary. This oil contains a lot of antioxidants that are useful also to suppress bad cholesterol. Olive oil is a healthy food the Mediterranean and is directly proportional to the level of their heart health. Olive oil also contains monounsaturated fats and vitamin E.
Furthermore, foods for lowering bad cholesterol is black tea. Exactly this is not food but drinks. Black tea contains antioxidants that not only useful for cancer but also for lowering bad cholesterol. According to research from the USDA, black tea consumption for three weeks can reduce cholesterol by 10%. The food was included in the “list of foods for lowering bed cholesterol” is nuts. Nuts such as walnuts, almonds contain polyunsaturated fatty acids that play a role in lowering bad cholesterol. The benefits of nuts are to maintain healthy blood vessels. But for those of you who want to eat peanuts as a cholesterol therapy do not consume nuts that have been mixed with salt or sugar. The foods for lowering bad cholesterol are easily obtained every where. But without maximal effort, the bad cholesterol also will not decline optimally.